If you are planning to do your Christmas food shop at Sainsbury’s, fit in what you can in the next week. Between Thursday 28 November 2013 and Wednesday 4 December 2013, when you spend £60 or more in a single transaction, you’ll get a voucher to use at Sainsbury’s petrol stations. The voucher will give you a sizeable discount of 10p per litre on petrol, diesel or LPG autogas. The fuel discount offer is available to shoppers in-store and to Sainsbury’s Online shoppers. The full terms and conditions are below. According to recent AA figures, UK drivers are now paying the lowest average price for petrol in more than two-and-a-half years – and almost 8p a litre less than we were paying in September. The supermarkets have been slashing petrol prices for the last couple of months, but this has to be the best offer yet. Undecided? If you want to check recent prices at your nearest Sainsbury’s petrol station, to assess for yourself how much you could save, you can use the free database at Whatgas.com. 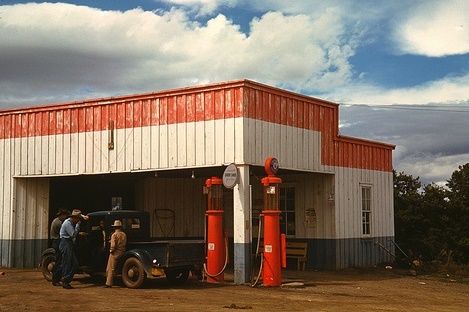 Image credit (obviously not a Sainos petrol station, but I like it): KurtClark. Sainsbury’s fuel offer: terms and conditions. 1. One till receipt fuel voucher to be issued per single qualifying store or online grocery transaction. 2. Transaction of £60 or over (excluding delivery charge and after any discounts have been applied) made until Wednesday 4 December inclusive. 3. †Online offer applies to groceries only. Online offer applies to deliveries made by Wednesday 4 December. 4. Voucher is valid for 14 days from date of issue. Coupon validity date is printed on voucher. 5. The following products are not included in the qualifying spend: scratch cards, petrol, diesel and LPG autogas, prescription medicine, infant formula, tobacco and related products, gift vouchers, BT phone cards, E-Topup, savings stamps, postage stamps, National Lottery products, car park tickets, vending machine purchases, purchases from coffee shops/restaurants. 6. Till receipt fuel voucher entitles 10p per litre off each full litre, up to a maximum amount of 100 litres per single transaction. 7. Discount available on one individual purchase of petrol, diesel or LPG for one vehicle, per voucher. Only one ‘money-off’ fuel voucher can be used per vehicle. 8. Vouchers cannot be exchanged for cash or other goods. Photocopied vouchers will not be accepted. 9. Till receipt fuel voucher is only valid at Sainsbury’s branded forecourts. 10. Till receipt fuel voucher is not valid for [email protected] transactions. 11. Sainsbury’s reserves the right to withdraw this offer at any time without notice. 12. Vouchers are, and shall remain, the property of Sainsbury’s Supermarkets Ltd.
13. Sainsbury’s cannot take responsibility for the loss, damage or theft of vouchers. 14. Standard terms and conditions apply to online purchases. 15. Northern Ireland only: Customers spending the qualifying amount, with separate till receipts from both alcohol and grocery tills, purchased no more than 45 minutes apart, must show both receipts to qualify for promotion. Promoter: Sainsbury’s Supermarkets Ltd, 33 Holborn, London, EC1N 2HT.